If you travel a lot and often shop for souvenirs to bring home, it's very likely you would have come across pewter keychains (also called pewter key rings). They are commonly found in souvenir or gift shops in tourist areas and in airports. 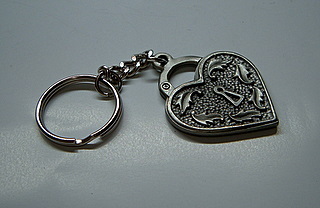 Most of the time the keychains will feature some important symbols of the country. For example, if you're in Singapore you will find many keyrings (or many souvenirs for that matter) that feature the Merlion, an imaginary creature with a lion head and fish body. It is a combination of the words 'mermaid' and 'lion'. There are also keychains that have other themes, and there are many of these. 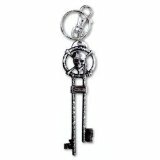 For instance, check out the pewter keychain shown in the picture below. This keychain is rather special. It is in the form of a heart-shaped padlock. You can see the 'keyhole' in the middle of the 'heart', and also the 'shackle'. I guess it is something suitable to give to that special one. It could mean that you want to 'lock' that person's heart, or that he or she has the keys to unlock your heart. Spin out any meaning you can think of! Can I use it as a pendant? If you take off that ring and chain, it will become a pewter pendant or a pewter charm. You can string a necklace through the little hole on top of the 'shackle' and you'll be ready to wear it on your neck. I actually think the design makes it very suitable as a pendant instead of a keychain. It's up to you to decide how you want it to be. There are many keychain collectors out there. Various themes are available to focus your collection on, such as popular characters, souvenirs or monuments. A great example of what you can collect is this cool keychain from the 'Pirates of the Caribbean - Dead Man's Chest' movie. Pewter keychains are easy and fun to collect, so why not get started?